Who doesn’t love cupcakes? They’re cute little personal-sized cups of yummy goodness that you don’t have to share with anybody! So, it comes as no surprise that the trend is carrying over and replacing full-size celebration cakes for weddings, Bar and Bat Mitzvahs and all sorts of other celebrations. 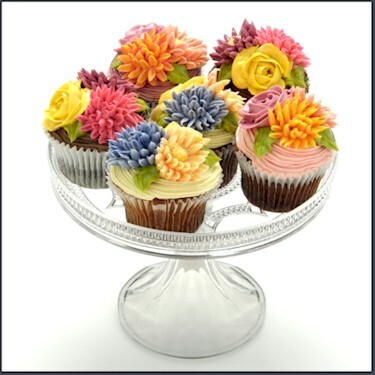 Bakers have scaled down the artistry of traditional cake-decorating so using the beautifully-crafted cupcakes means that each guest is able to admire their very own piece of artwork when it’s placed in front of them. What could be more special? One thing I especially love about using cupcakes at your Bar or Bat Mitzvah is that your guests can have their cake and eat it, too! Simply have your baker make up twice as many cupcakes as your guest list calls for. The more cupcakes, the grander the display! Your guests will be doubly impressed and thrilled when, after serving your sweet treats, your catering staff packs the remaining cupcakes up in adorable personalized boxes so you can send the extras home as parting favors to be savored the next day. 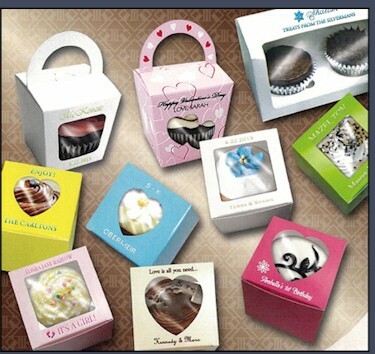 These boxes from Krepe-Kraft are available through Invitations4Less.com. Just contact us for assistance in ordering! Now the only decision is which flavor? !